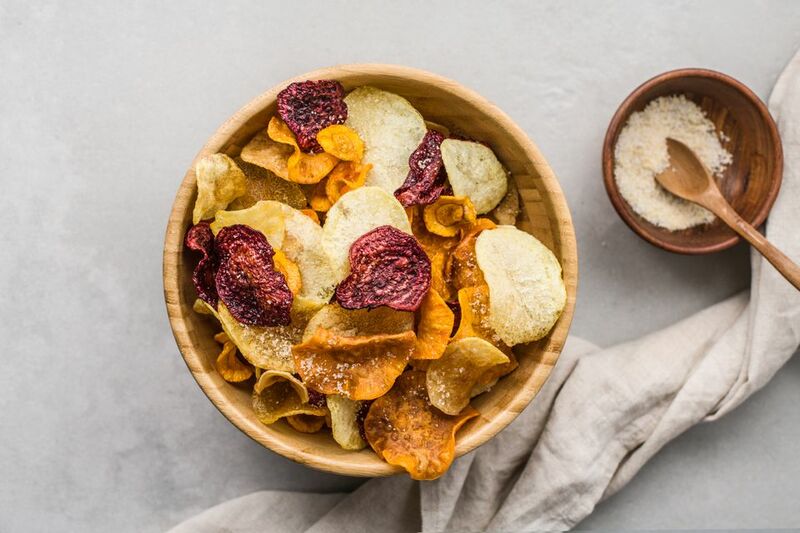 Making your own vegetable chips, whether you fry or bake them, is easier than you think. Plus, you get to pick what vegetables and seasonings you want to use for your homemade veggie chips. Using a mandoline, a food processor fitted with the 2 mm slicing blade, or a sharp knife, cut the vegetables into very thin slices (1/16-inch thick). Fill a large bowl with ice water and transfer the carrot, parsnip, sweet potato, and Yukon gold potato to the ice water. Fill a small bowl with ice water and transfer the beet slices to the smaller bowl of water. Let the vegetables sit in the water for 30 minutes. Line 2 baking sheets with several layers of paper towels. Drain the vegetables and arrange them in a single layer on the towels. Pat the vegetables to remove any excess water. Line 2 plates with paper towels. Heat 3 inches of oil in a heavy-bottomed Dutch oven over medium-high heat until it reaches 350 F using a deep-frying thermometer. This will take about 8 to 10 minutes. Add about 1/2 cup of vegetable slices to the oil and fry until crisp and golden brown, about 2 minutes. Remove the vegetables to the paper towels to drain. Remove the paper towels from the baking sheets and spread the fried vegetable chips in a single layer on the sheets. Place in the oven to keep warm. Repeat with the remaining vegetables, maintaining the oil at 350 F.
Make the seasoning mix: In a small bowl, combine the salt, garlic powder, and onion powder. Put the warm chips into a large bowl, add the seasoning mixture, and toss lightly. The vegetable chips can be stored in an airtight container for up to 2 days. Humidity can make the chips soggy, so it's best to make them on a sunny, dry day. To bake the chips instead of frying them, place them in a single layer on greased baking sheets and bake at 375 F for about 20 minutes. Remove from the oven and sprinkle with the seasoning mix. Let cool for about 5 minutes, then transfer to a shallow serving bowl. Almost any root vegetables are good to make chips. Other options include rutabaga, turnips, celery root, and yucca. You can also make sweet chips with this recipe using apples, pears, or plantains. Season them with cinnamon sugar instead of the salt mix. Use the chips crushed in coatings for fried foods, in place of breadcrumbs, or as a topping for soups.